At a dinner party attended by a few affluent couples, there is the usual chit chat and gossip. There is also talk of a comet that is supposed to pass overhead that night. Midway into the dinner, the lights go out for the entire block save for one house down the street. There are no stars just absolute blackness around the area. A couple of the dinner guests go to investigate. They return with a metal lock box containing a ping pong paddle, and photographs of everyone in attendance at the party. Even more disturbing, the house down the street is the same house they just left with identical people inside. It’s difficult to discuss Coherence without spoiling it. I would recommend this film to anyone who likes their science-fiction filled with doom and mystery. I would also really advise going into it completely unspoiled. I’ll try to not explain the central mystery outright, but be warned there may be light spoilers from here on out. Huh, I guess being rich and white isn't going to get us out of this one. Coherence takes more than a few pages from the film, Primer (2004), with naturalistic dialogue, and a minimal aesthetic that belies a complex series of events. Coherence is by no means as deliberately obtuse about its events as Primer. In fact, it’s quite the opposite, Coherence keeps things very simple but slowly adds details until the situation is not what initially seemed. It’s very competently written. It smartly begins with the overwhelming dread of the unknown and builds on that as not only do the characters begin to fear for their physical well-being but eventually their identity.es I was even more pleased that it didn’t just stop with the revelation about what is really happening. Coherence is happy to force its characters to confront their own morality in an effort to survive. I feared the interpersonal drama of all the dinner guests would merely serve as filler in between moments of revelation. The film smartly uses these earlier personal moments to push its characters to extremes in the third act. Yeah, I was in Pinata: Survival Island. What about it? This was a micro budgeted production and as such it really isn’t an amazing looking film, there are no big set pieces or even much in the way of special effects. It feels like an extended Twilight Zone episode or even with a little tweaking it could probably be staged as play. The audio sounds a little muddled, especially with numerous characters talking over one another. Whether this was a deliberate choice or a limitation of the budget, I can’t tell. 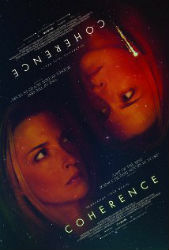 I really enjoyed Coherence. It showed a willingness to propose a concept and really explore what that situation would be like on a personal level. I appreciate its willingness to do so even with very limited means. This is director James War Byrkit’s first full length film and I look forward to seeing what else he creates.